At the end of 2001, around December, former Nirvana bassist Krist Novoselic joined a new trio called Eyes Adrift. Eyes Adrift is Novoselic's first full-fledged band in several years. Not since Krist teamed up with Yva Las Vegas to form Sweet 75 back in 1995 have we seem him take part in a major project. The line-up couldn't be any better. 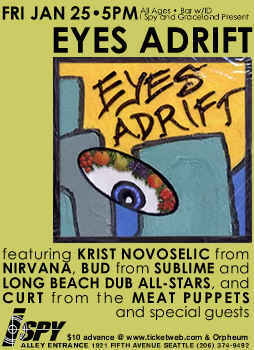 Besides Novoselic, Eyes Adrift includes Meat Puppets main man Curt Kirkwood on vocals and guitar and the Long Beach Dub Allstars' Bud Gaugh (Formerly of Sublime) on drums. Kirkwood says Novoselic contacted him at his Texan home after seeing his solo show in Seattle. It was a pure coincidence that Gaugh also rang Kirkwood looking to form a new band, and so Eyes Adrift was born. Kirkwood had played on Nirvana's 'Unplugged' album but hadn't previously met Gaugh. Like Nirvana, the Meat Puppets too were saddled with drug problems, theirs stemming from Cris Kirkwood's addiction to heroin. The older Kirkwood eventually carried on without his brother, revamping the Meat Puppets for last year's unremarkable comeback album "Golden Lies." Gaugh himself has had troubles in the past with heroin, his good friend, the lead singer of Sublime died of a heroin overdose. Eyes Adrift got together in December 2001. Their self-titled debut album was released on September 24, 2002 on SpinArt Records. Pick it up, it is a really good record!